Initially developed as the resident shows of Jordan Waeles on NRJ, Trance Mutation Broadcast soon exported itself to other formats, such as weekly mixes in Rob van Holland's Energy, on Radio Saffier & LRK, local FM radio stations in the Netherlands. With Rob's departure, Jordan took over the shift and made a full-blown friday evening show out of Trance Mutation Broadcast. Featuring sets in different trance-related subgenres and appearances from Guest DJ's such as Giorgio Ponticelli and DJ Jonno, Trance Mutation Broadcast demonstrated the wide range of capabilities of Jordan, as a host, as a DJ and a radio producer. After a dozen of shows, Jordan Waeles had to give up his residency as he didn't have the time to do it anymore, due most importantly to his daily work. 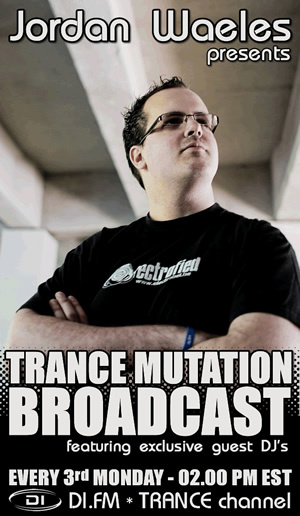 Trance Mutation Broadcast however kept evolving, featuring here and there special mixes (techtrance, retro or extra-long sets are not too uncommon) and original tracks and remixes by Jordan Waeles himself, to the format that we know nowadays: 2 hours of trance, often starting a bit more on the progressive side, and often finishing in an explosion of tougher tech-trance beats, after a long climax of the most uplifting tunes blended seamlessly and harmonically together by Jordan Waeles. After 4 years of the show airing on NRJ, Jordan moved it on the world's biggest Trance radio, Digitally Imported. Many guests have joined the adventure: Ferry Tayle, Fast Distance and Wellenrausch are only a few of the artists that brought awesome guestmixes to the show. Check the podcast for the past shows!